Behavioral Health Outpatient Services for Adult and Youth | Family Counseling Center, Inc.
Behavioral Health Outpatient Services for both Adult and Youth customers are facilitated toward improving the client’s daily functioning life skills. Clinical Services may be arranged by contacting any Family Counseling Center office for an appointment. There is normally no waiting list for services and appointments are usually scheduled within one to two days. Substance abuse services are also provided in an effort to decrease or eliminate the negative effects of alcohol and drug use on the client, the family and the community. The center provides outreach services in the client’s home, at school, or at other appropriate locations. The location of services is mutually determined by the clients and FCC staff. Initially, an assessment is made of the client’s service needs and the client is assigned a case coordinator, who is responsible for development and oversight of an Individual Service Plan. Fees for most services are assessed based on a sliding fee schedule. Fees are set at the time of the initial appointment. The privacy of clients is of primary concern to the Family Counseling Center. No information is released without written consent of the client. All staff members must abide by a code of ethics regarding client confidentiality. FCC provides informational/educational programs to civic groups, schools, or businesses free of charge on topics related to prevention of mental disabilities and substance abuse. The Family Advocacy Center, located at 1401 Washington Ave in Cairo, Illinois, hosts services geared towards families who are at risk of having or currently have involvement with DCFS and includes counseling, advocacy, mentoring, case management, entitlement assistance, parental and family support, employment readiness training, and financial literacy training. Additionally, the assigned family advocate/counselor will serve as a case manager and gatekeeper to refer the family into any needed service including substance abuse treatment, mental health treatment, psychiatric evaluations or medication monitoring, homeless services or domestic violence services. It is the goal of the Family Advocacy Center to keep families together through providing multi-layered support and improving the overall functioning and well-being of the family. Although referrals from DCFS for families with open cases or investigations are a priority, the Family Advocacy Center can serve individuals with closed cases, post-adoption families, and self-referred families, and those referred from other community agencies as they are able. The program will primarily serve those living in or near Alexander and Pulaski Counties. Family Counseling Center, Inc. will be working closing with the local DCFS and POS agencies, when appropriate, in the provision of service to referred families. Monday through Friday, from 8:30 a.m. to 4:30 p.m.
Evening appointments may be scheduled as needed. 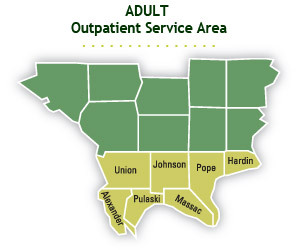 Adult Service Area: Alexander, Hardin, Johnson, Pope, and Pulaski Counties. Youth Service Area: Alexander, Hardin, Johnson, Massac, Pope, Pulaski, and Union Counties. Did you know there are four (4) Prescription Drug Take Back Programs in the Southern Seven counties where you can safely and responsibly dispose of unused prescription and over-the-counter medications? NO QUESTIONS ASKED! >> Click here for more information about our Outpatient Services!